As parents we want our children to look their best. They are a true representation of our parenting. We strive to make sure that their hair is neatly in place and clothing is immaculate. A physical representation is only part of a sign that you are a good parent. In addition to taking care of children physically, parents instill core values and beliefs. With the hope that we create well- rounded child. This is no easy task. Developing a well rounded child does not happen overnight. There are building blocks used throughout your child life. Family support is crucial. As a parent our goal is to make sure that our children feel confident, competent and secure. Actively encourage children to develop positive traits. This form of positive conditioning will become innate in the years to come. What is really important is that children pick up on what we see do. Allow them to see you engaging in behavior that mirror what you expect from them. As parents we are our children best role models. If we want them to be leaders of tomorrow, we have to start at home, today. Practice developing character by doing. To help children to better understand about sharing and giving we have to teach empathy. Why not take part in a toy drive. Make them understand that there are people who are needy, and we should help out when we can. To get a sense of community, allow your children to take part in activities that interact with the public. Throughout these learning activities, be sure to continue to praise your child. They will feel like what they contribute matter. In return building confidence and developing leadership skills. Every child is unique and it is important to nourish their abilities individually. If your child is artistic, purchase supplies that can help him or her enhance their creativity. A child with a love of sports, music, and dance will benefit from time with you to develop these skills. Parents should continue to find opportunities to feed their thirst for knowledge. Continue to maximize your child learning experience. Being a mom is a nonstop gig. We invest a lot of time, effort to help our children grow. Sure, as parents we plant the seeds that help shape a well rounded child. Our actions should be in good nature and a true reflection of what we are trying to teach our children. Be sure to have wholesome family time, praise with hugs and correct mistake through learning experience. Remember, children imitate what we do at a young age. Understanding how to dress a child is another task that parents must learn. Having children attired in fashionable garments is possible when parents make good shopping decisions. Often, clothing manufactured specifically for children is sewn from flame-retardant materials. A parent must examine each garment for safety concerns such as zippers that can pinch sensitive skin or loose embellishments that are a choking hazard. Garments are usually easy to machine wash and tumble dry on laundry day. Because children grow quickly, most parents want to purchase clothing that is reasonable priced. A child also wants a comfortable style that allows moving with ease. Before a baby is born, families begin gathering clothing such as bodysuits, pajamas, outerwear, booties and diapers. Clothing for infants must easily fit over cloth or disposable diapers. Buying garments with snap openings is vital to make it simple to change diapers quickly. Choose clothing made from soft but insulating fabrics that are quick to wash and dry. Dressing a baby fashionably is still possible because clothing manufacturers create many different designs. There are garment options for boys in blue fabrics with embellishments of sport teams, cars and animals. Alternatively, baby girl’s clothing is often in pink hues with designs of flowers, hearts or bows. A toddler requires rugged clothing that can withstand crawling and rough play. Many children this age alternate between wearing diapers and toilet training. Making it easy for a child to push down pants or shorts during a bathroom visit is essential. Alternatively, parents may want to buy garments that have snap openings to make it simple to change a rambunctious toddler’s diaper. Clothing for toddlers must fit nicely with a small amount of looseness for rapid growth. Due to rapid growth, buying garments with adjustable straps is a great plan. Children may begin to request particular colors, styles or designs of clothing. A toddler may also want to wear garments with favorite television or movie characters. Giving a toddler an opportunity to choose clothing is a great way to help a child develop independence. School-age children definitely have independent ideas about clothing styles. Dressing like friends is vitally important for older children. Fashions for this age group change rapidly making it impossible for parents to keep up with the current trends. The best plan is to communicate carefully with a child before buying garments. Parents should bring a child along on shopping trips to try on garments while choosing acceptable clothing. Many schools require specialized uniforms while establishing other requirements for garments such as pant length or shirt style. Finding basic sweaters, slacks, shirts and skirts for school activities is of primary importance. At the same time, older children should also have dressy garments such as dresses or suits for special occasions. Parents may also need to discuss a family’s clothing budget with older children who demand expensive garments. Smiles and rose petals are what little flower girls are made of, and when it comes to what type of flower girls dress they will be wearing for the big event well the choices are plenty. Every little girl wants to look like a dream for the part of the wedding she is in, so that “all perfect” flower girl dress is important to her. There are a huge variety of styles, shapes and colors to choose from, but it all depends on the theme, look, and desire of the bride on what the flower girl will be wearing. There are a few choices in 2013 that seem to be topping the board in flower girls dresses and curly bottom dresses are one of them. With an ever-changing fashion life, curly bottom dresses seem to be a perfect choice that can fit almost every wedding theme. Fun, the curly bottom dress is silky and light as it sways around the calves of the child wearing it. Topped with rose petals or other small designs the colors are endless and the style perfect to present to the people attending the event the first look into the beauty of the wedding. Fluffy and layered to puff out and the bottom edges distinctly curled into small bottom ruffles, the curly bottom dress is beautiful and unique. The organza flower girl dress is somewhat a little more reined in and Victorian. Most organza dresses, are gathered at the waist and tucked under at the hem. The look is very elegant as varieties of high-end fabrics creates a one of kind and breathe taking styles for the wearer. Some organza dresses have small details that accent the theme of the wedding or big event. to remember and smile about. The classic flower dress is always an option if you are looking for a more reserved and refined flower girl dress. Thick layers cover the dress that forms this dress into a short flair straight-line dress. Regardless if the dress is ivory, white or with a solid color, the classic dress is seemly formal and elegant keeping with the theme of a gathering that has a touch of class. The last special dress of the season to make the top five is the pickup dress. This dress is one of the most favorite dresses any child can wear. Longer than most, thick and silky with under lace layers it is made so that the dress will be puffy and prominent. The pick-up dress with ease as the wearer holds onto the sides and pick it up slightly as she flows along the walk way. This dress often says “WOW” as the people watching the event see a little bit of history and modern day come together designed to bring some fun and flair to the event. A flower girl dress can set the pace and feel for what is to come, so making sure her little dress is a hit can be important. She will bring smiles and giggles as she graces everyone with her style and personality, while she is wearing the dress chosen for just her. Weddings can be one of the most memorable and special occasions in a persons lifetime.With a million tiny details to remember, it is important that everything in the end run smoothly. The wedding party is an important group of people that is often comprised of family and friends from both the bride and groom. This includes the flower girl and the ring bearer. In fact, of all the people that are involved in the wedding party, the flower girl and ring bearer are often a special part of the fun and festivities at a wedding. Many couples feel that these two child roles are a vital and fun part that brings a bit of childhood innocence to a wedding. While wedding attire can generally run into the hundreds of dollars for most people in the wedding party, this can be a difficult expense for some couples and families to expend. Certainly in today's tough economic times, people are looking for ways to save money and still find great wedding attire. One of the great places people can save money who participate in a wedding is with the children in the wedding party. Today, with children's attire who are in the wedding party running over $100 dollars at many clothiers, it is great to find wonderful wedding outfits for a much more reasonable cost. At My Kid Studio, families can find excellent prices on all the attire they need for flower girls and ring bearers at a great and reasonable cost well under the $100 dollars average cost. When looking for the right attire that can easily match any bride's wedding gown or groom's tuxedo, My Kid Studio has a great variety of choices at some of the best prices on the market today. The special designs that My Kid Studio offers for children include many designs of light and frilly gown dresses for little girls, and fine black formal tuxedo's and full suits for boys. In addition, since the ring bearer tuxedo's for boys can be purchased and not rented, they can be either resold or preserved for another use after the wedding. The same applies for any of the special little flower girl gowns. Because the cost of most of the suits, tuxedo's and dresses at My Kid Studio are under $40 dollars, the investment can be more readily recovered. Many of these can easily be reused for another special occasion like a holiday. This is great news for parents who are trying to save money on their children's clothes when they are participating in a wedding party. At My Kid Studio, we understand that building memories with the kids who are participating should be focused on the innocence and fun. We Believe cost should not be an inhibitor to letting them participate. With the great prices on girls dresses, boys' suits and tuxedos at My Kid Studio parents will find the prices are exceptionally reasonable. Most of the prices are similar to buying any special holiday attire found retail outlets. yet all of these are made with a much higher standard of materials. Flower Girl Dresses are often accented and finely created with Satin, Sateen, Lace and Tulle. The boys' suits and tuxedos are also manufactured from the best quality materials. Also, in addition to the variety of styles available, the sizes at My Kid Studio are vast as well. The sizes and colors offered on the dresses is quite extensive. The range of dress sizes are from 12-18 months to size 14 for girls. For boys, the sizes range from 2 T to size 20 for older boys. 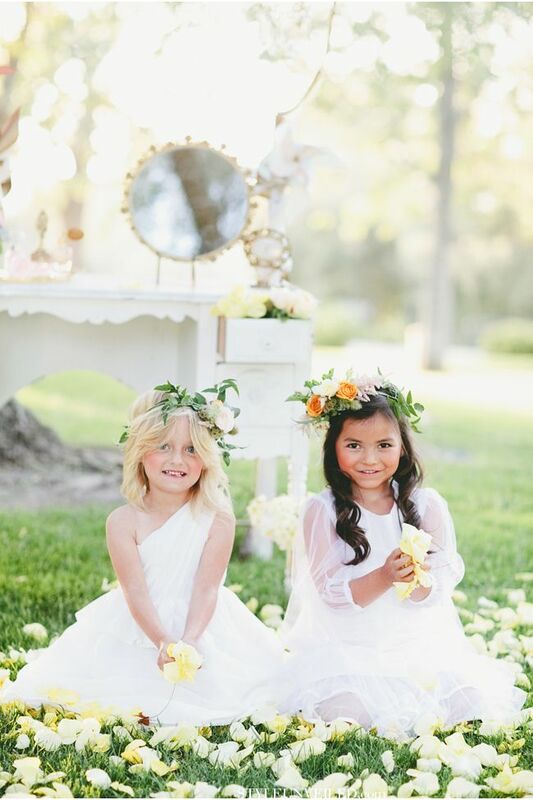 The experience of being a flower girl is one that a little girl will never forget. This special time in her life makes everything important. Parents and brides alike want the little girl to feel special and look cute as a button. She also must look and feel elegant. At My Kid Studio, we offer several choices for her day. Here are a few excellent choices to consider. Our Rose Petal Dress is a choice for any flower girls perfect look. It is elegant and easy to wear. Make no mistake, there's really colored rose pedals inside of the netting. The top layer is made from a gorgeous bridal satin cloth. You have the choice of a white bodice or a colored one that matches the rose petals. From there the bodice goes down into a fluffy skirt that has four layers of tulle material. The rose petals are added into the next layer of netting of the skirt and they are removable. You can choose from several color choices. Really, just about any color of the rainbow can be created for your little flower girl's perfect day. It is the finest choices for weddings that use roses in the wedding floral displays. The bodice zips up with a hidden back zipper. The dress is complete with a matching sash. The dress comes in sizes 0 months to 14 years. No matter what age your little girl is, she will love this dress. The dress has a satin bodice that has delicate organza flowers with satin ribbons to accentuate the look. This goes down into the four-layered skirt that starts with a soft lining those poufs out into a crinoline for a full skirt effect. The next layer offers netting to for an angelic feel. The feel of the skirt is full and perfect for pictures or spinning around for fun. She will feel like a princess. The dress is tea length and offers a bow over the hidden zipper for a perfect fit. Sizes toddler through 12 are available in many colors of the rainbow. It is appropriate for both day and evening weddings. Our site offers complete instructions for measurement of all of our dresses. My Kid Studio is one of the largest children's dress sellers. Our prices are reasonable and the quality is perfect. Every little girl that wears one of our flower girl dresses will feel special and look cute an angelic button. Make your little angels special day complete with one of the above choices for her walk down the aisle. Your satisfaction is our goal and we appreciate any feedback that you offer. Let us know what you need and we can help you find it at a perfect price. We are here for you whenever you need us. We guarantee our dresses. You will love each dress that you receive. Come visit our site today to see what we can do for your little angel.